Last month I discovered these little gems. You can make the batter a couple hours ahead of time and bake when you want. When I made my first batch and bit into one, it was a surprise to find it wasn't very sweet. You expect a muffin to be sweet. But you've got to remember one word in the recipe name: pancake. And that's what these taste like. 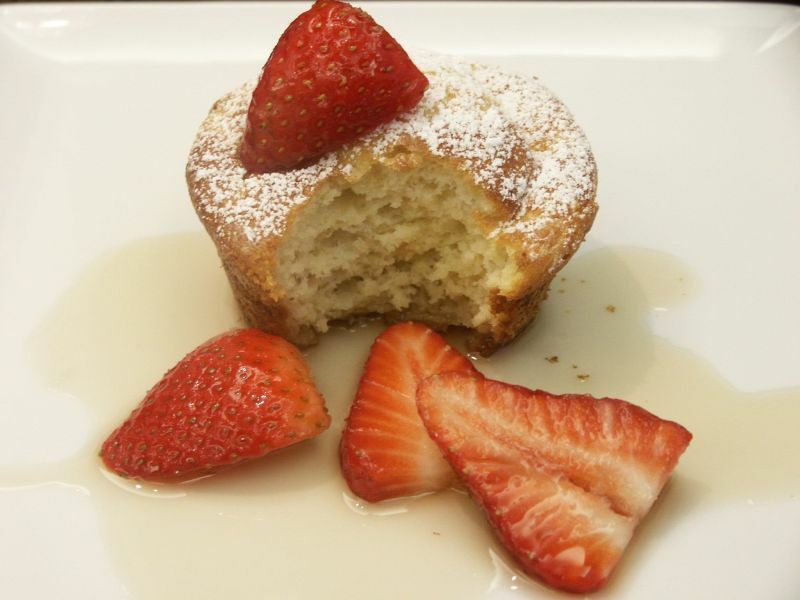 Pancake in flavor, but light and airy like a soufflé and shaped like a muffin. All bases covered. You're gonna love these for breakfast or Sunday brunch. You can serve them with only maple syrup of course, but it's interesting mixing the syrup with fresh fruit...or, if you prefer, top with jam and some crème fraiche. Keep thinking pancakes here. Anything you like on your pancakes, you're going to like on these. They were a hit with my troops and you should have seen the surprised looks when everyone thought they were biting into a muffin! Position a rack in the center of the oven and heat the oven to 400°F. Liberally spray two 12-cup muffin pans with the cooking spray. In a medium bowl, mix the all-purpose flour, cake flour, baking soda, baking powder, and salt; set aside. In a large, clean mixing bowl, beat the egg whites and cream of tartar with an electric hand mixer on medium-high speed to firm (but not dry) peaks, 2 to 3 minutes. Set aside. In another large bowl, beat the egg yolks with the mixer on medium-high speed until thick, ribbony, and lemon-yellow, about 6 minutes. Add the melted butter, sugar, and vanilla; mix on medium-low speed until combined, about 30 seconds. Add one-third of the dry ingredients and mix on low speed. Add one-third of the buttermilk and mix to combine. Alternate adding the remaining dry ingredients and buttermilk, ending with the buttermilk and mixing until just combined. With a large rubber spatula, gently fold the whites into the batter, leaving some streaks. Scoop about 1/2 cup of the batter into each muffin cup—you can fill the cups to the rims. Bake, rotating the pans after 10 minutes, until browned on top and puffed, and a toothpick inserted in the centers comes out dry, 20 to 25 minutes total. While the muffins are baking, bring the maple syrup to a boil in a small pot over medium-high heat. Put the strawberries in a medium serving bowl. Pour the syrup over the berries and set aside in a warm spot. With an offset spatula, pop the muffins out of the cups and arrange on a platter. Sprinkle with confectioners’ sugar and serve with the syrup. This look absolutely good ! must try one day. Ya. come and join my 1st giveaway..Thanks. I know pancakes aren't hard to make but sometimes the thought of standing over the stove first thing of the morning is just so not appealing. These sound like the perfect alternative! Pancake soufflé? These are way cool, Barb!! They look good, and nice that they aren't too sweet! Even better that you can make the batter ahead. Barbara... I have an admission... I have never owned a can of cooking spray! I always grease things! Weird, right? I can't get around the idea of spraying oil. Same issue I had with margarine and crisco... just bugged me. THAT said.... lovely recipe. I Like the idea of mixing it up a little and giving a pancake a new shape... but will oil the pan the old fashioned way! Ooo, I like the idea of serving these with jam and creme fraiche too! How interesting. Not really a fan of muffins, but I sure like pancakes, so this would be ideal. Must say I did a double take when I read the name of these treats, my brain couldn't focus :) Sounds like a food in search of an identity! How delightful Barbara. These are precious. I'm not much of a muffin fan other than those that lean towards the savory. I would like to try these for lunch perhaps. Lovely and so fluffy! A wonderful treat. Perfect with fruits. I can imagine that these pancake-like muffins have a soft and tender texture. Great that the batter can be made up ahead of time! fluffy and puffy, sounds excellent! I swear... you really do have your own recipe folder on my laptop!! That one, I might try Sunday morning. I'll skip the powdered sugar though - totally not a fan, but the Knight makes up for me! Just the thing for a special Father's Day brunch. Beautiful photos, Barbara. All bases are covered is right...I love your description of these pretty muffins! They would be really fantastic as part of a summer brunch. What a great idea! I'm definitely going to remember these. Great mackerel! THAT is a breakfast. My husband will love these Barbara! Anything to do with pancakes, as he was raised on them. Every single morning his mother made pancakes and eggs for her children. Many farmer's wives in that generation did. If I would have been raised on a steady diet of pancakes every morning, I am afraid of what I would look like now.lol! I LOVED the post about Gerald and Sara. I find stories like theirs so interesting. What a wonderful write! I want to thank you for your comment Barbara. It meant so very much to me and made my heart smile. oh yumm, perfection for a treat or breakfast. They look wonderful! I once made something very similar, but I've got to say, these look a lot better. What a wonderful idea! They look and sound delicious. I love applesauce or jam on my pancakes. I would love to try making these. gorgeous gorgeous! what a fun spin on the pancake, i love these! What a delightful discovery, these sure sound like a must try, so good with strawberry maple syrup! oh my, these look wonderful and with the perfect texture! Guess what I'm making with the girls this weekend? These look perfect! Thanks, Barbara! Hullo Babara , am sooo sorry wasnt around but jus got to replying to ur sweetttt comment! Was soooo glad to have u over! 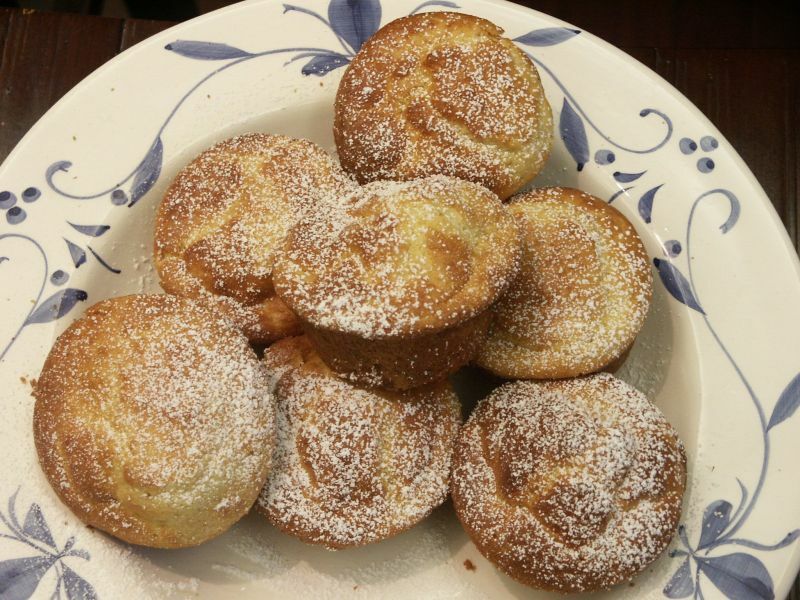 The pancake souffle muffins are brilliant , truly they are. U come up with the most wonderful recipes and i love them paired with strawberries so muc! Ben was just craving pancakes! The muffins look so soft,light and moist! What a great name. Wish I could reach in and grab one. These are FUN! What a great way to "present" pancakes and maple syrup. Panckake. Souffle. Muffin. How can those not be delish! Hmm... I wonder if I could recreate them gluten-free. Must try soon! These look delicious, and definitely worth a try, especially since I love strawberries. However, I refuse to turn on my oven until this heat wave breaks! It's going to hit 100 degrees in New England today! I wish you could have joined us at King Arthur, we had a blast! These look delightful! I love muffins in any guise, and I'd like to try these. Wait..you made these last month and what to tell us about them??? SHAME ON YOU! These look beyond heavenly! aren't these interesting. never seen these before, but i'm glad i did. one could kick this one up a few notches several ways. love it. Lovely, just lovely Barbara. What a fabulous idea and strawberries are gorgeous just now. Just dreamy! What a wonderful breakfast recipe! Oh goodness, Barbara,. They look heavenly. I'd love to bake these for Marion. I just know she would love them!!! These sound like a perfect mix of textures and tastes! I'd love these with a combination of fruit and maple syrup. OOOOOOH! Guess what I'm making next week!!!! i'm pretty obsessed with pancakes, and this is an awesome way to meet that need without hovering over a hot skillet. lovely recipe, barbara! They look beautiful! Thank you for telling me to look out for them! i make at least 2-3 times a week pancakes for my daughter. 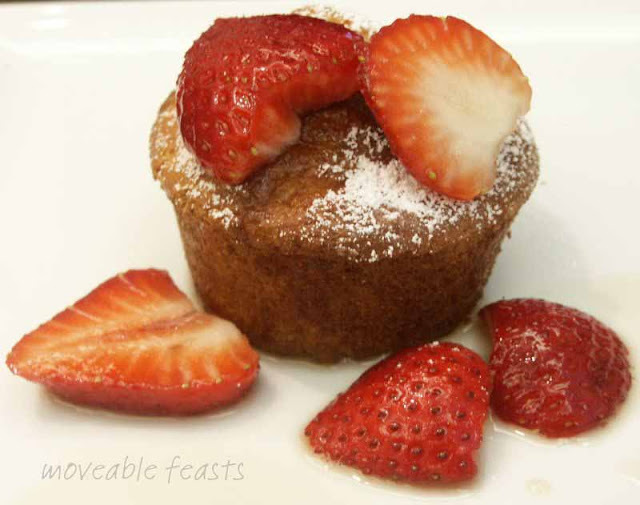 I love the idea of pancake muffins, bake once and have for few days. Great! Oh Yum! Pancake in a form of a muffin? Fantastic! I'd like to poke holes in the muffins and drench them in maple syrup!